Happily, Big Finish has a habit of tapping Peter Davison for historicals, following the examples of The Visitation and Black Orchid. The first Main Range audio with a Doctor/companion team, Phantasmagoria, is better than either of those. It’s set in England (of course) at the dawn of the Enlightenment. Highway robbery, hauntings, a house of gambling and a house of horrors add spice and vice to the adventure. This audio is a modest beginning, and yet it’s more than that: it picks up so seamlessly in the style of classic Who Season 20/21 that it’s hard to believe this story was produced 15 years later. It’s a homage to The Talons of Weng-Chiang, minus the offensive racism, plus a dash of The Awakening. It’s not a great story, mind you, and Big Finish was soon turning out better. But it’s a solid, workmanlike adventure. 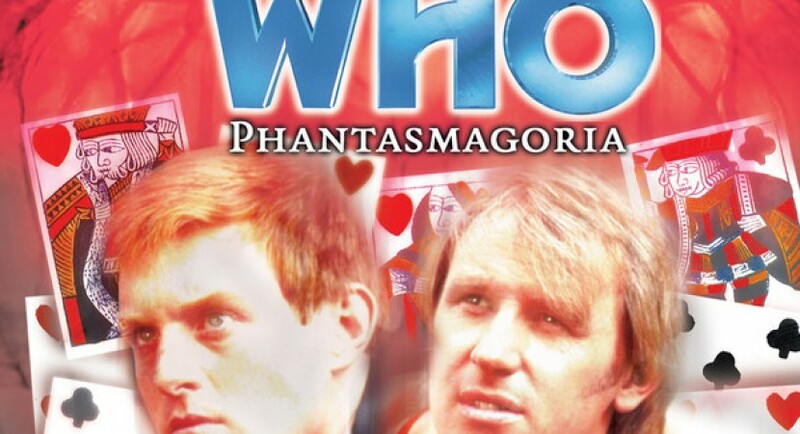 On first listen, I was annoyed that Turlough is separated from the Doctor almost immediately. I’ve since become more reconciled to the Big Finish device of splitting up companion(s) and Doctor so they can each interact with a different set of guest characters and tackle the same story from multiple angles. Still, I mourn the fact that there’s so few audios with Peter & Mark, Team Sarcasm, working together. Instead, Five sets off to investigate spectral visitations and reports of missing persons with Dr. Holywell as his Watson— or his Professor Litefoot? Meanwhile, Turlough falls in with some earnest young dandies trying to track down one of their own missing number. The dandies are a hoot. Holywell, a gentlemen with one foot in science and the other in occult studies, is very much a product of his times. The surprise is his maid Hannah. She’s the only lady in the boy’s club, but I’m happy to say that Big Finish gives her the depth a classic Who episode probably wouldn’t. About the only important secondary character who isn’t all that interesting is the affably sinster Mr. Valentine, but he has such a great Black Guardian laugh that even he can be entertaining. I also have to give a shout-out to guest actor Jez Fielder aka Jeremy James, who will be back as Nyssa’s husband and Sarah Jane’s sidekick. Not only does he pull triple duty in Phantasmagoria as the highwayman, the Diabolo club butler, and a stuffy librarian, but he also speaks the “And now, it’s the welcome return of Peter Davison in Doctor Who” lead-in. Nicholas Briggs and Mark Gatiss take a turn on both sides of the microphone as well. On the other hand, I love Hannah. Her gender-bending stint as Major Lovemore is a promising twist: even the servants and minor characters in BF may be more than they seem to be, and we can’t assume passive female characters are simply that. Also, I’m amused that as soon as the Doctor loses Turlough, he immediately adopts a temporary companion. Sorry, Turlough. First audio Turlough story, presumably shortly after Tegan’s gone. The next Turlough story after this is Loups-Garoux.